Don&apos;t tell anyone, but the Ice Coast is actually pretty awesome when it comes to snow quality. These are the readers&apos; picks for the places to go no matter what the snow report claims. "The Jay Cloud is legendary in New England. This mountain consistently gets more snow than anywhere else around, and it&apos;s always the best snow in the east." Photo courtesy of Jay Peak. Looking for more top 10 action? 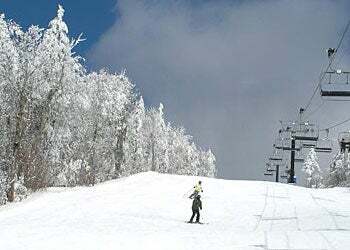 Check out the top 10 grooming operations on the East Coast here, and the top 10 overall Eastern North American Resorts here.